Headsets throughout the tour (not available on cruise). Check into your hotel. The rest of the day is free for you to explore Italy’s ancient capital using your CosmosGO app. This evening, meet your Tour Director and fellow travelers. The “Eternal City” is steeped in history, vibrantly alive and exciting, and absolutely unique! Included sightseeing with a Local Guide starts with St. Peter’s Square and Basilica. Other highlights are the iconic Colosseum, the largest amphitheater ever built and Circus Maximus. An optional visit is available to the Vatican Museums and Sistine Chapel, world famous for Michelangelo’s The Last Judgment. Vistas of rolling hills, cypress trees, vineyards, olive groves, and rural villages form the backdrop of your journey through beautiful Tuscany. Stop in Pisa and enjoy a mini-train ride to see the Square of Miracles and the amazing Leaning Tower, then on to the Florence area. End the day by joining the optional Tuscan dinner in a typical restaurant. This Renaissance gem and city of the Medicis will keep you enthralled the entire day. Don’t miss out on the included walking tour with a Local Guide, which features most of the city highlights. You will see Piazza Santa Croce; beautiful Piazza Signoria; Palazzo Vecchio and its courtyard; Loggia dei Lanzi; and, to top it all, Piazza del Duomo and its cathedral with the Giotto Campanile. Later, enjoy dinner at a local restaurant. 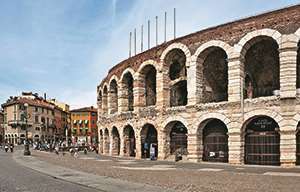 Journey north to enchanting Verona to see the legendary balcony from Romeo and Juliet and spend some time at leisure strolling around Market Square. Continue to the Venice area. Venice is more like a marvelous film set than a real-life city, with its crisscrossing canals, gondolas and water buses, arched bridges, palaces, and quiet little piazzas. Take a BOAT RIDE to St. Mark’s Square and enjoy time at leisure and a chance to watch Venetian GLASSBLOWERS at work. Don’t miss out on the optional gondola trip, gliding along the picturesque canals with a local troubadour to serenade you. Travel across the flatlands of the Po Delta to reach Ancona on the shores of the Adriatic, to embark on the FERRY for the crossing to Patras. During the crossing, enjoy all the ship’s facilities. 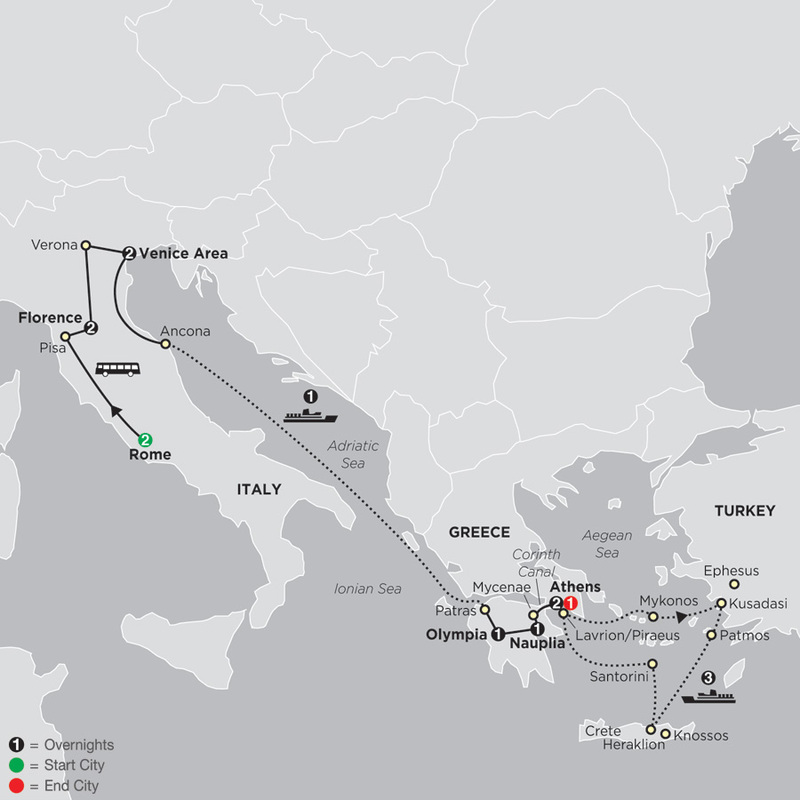 Disembark in Patras and drive south into the Peloponnese to Olympia. 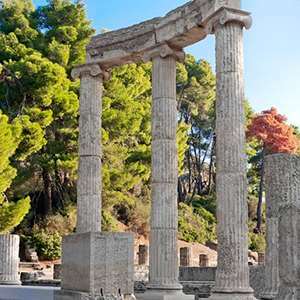 Enjoy time at leisure, or make the most of this morning by taking the optional tour of the sites of ancient Olympia, including the ruins of the Temple of Zeus. In the afternoon, enjoy the rugged scenery of the Peloponnese on the way to Nauplia. This evening, enjoy dinner at a local restaurant. Make a morning visit with a Local Guide to the impressive ruins of MYCENAE, an ancient city of Homer's epics. Later, stop to view the Corinth Canal, which was built between 1881 and 1893. 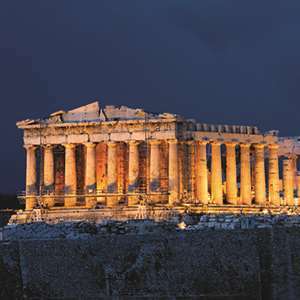 Join the included sightseeing tour of Athens, featuring the highlights of the ancient capital and a visit to the ACROPOLIS. Explore the shops and museums or take a trip to the coast to swim. In the evening, enjoy the lively atmosphere of the tavernas in the old Plaka district with its narrow streets and sound of bouzouki music, or join an optional Greek dinner. Board your cruise ship. Afternoon cruising in the Aegean on your way to Mykonos with its white houses, chapels, and windmills. Late-evening departure for Kusadasi, Turkey. Two ports of call today. First, Kusadasi on the Turkish coast. An included excursion is available to the fascinating Greek, Roman, and Byzantine excavations of Ephesus. Next, discover the tiny Greek island of Patmos, where St. John the Divine wrote the Book of Revelation. The 11th-century monastery with its valuable manuscript collection is well worth a visit. First port of call today is Heraklion on Crete. Join the included excursion to Knossos, the center of the 3000 Minoan civilization. Afternoon call (weather permitting) at Santorini, the “Black Pearl of the Aegean.” An optional shore excursion takes you up to the cliff-top village of Oia for one of the world’s most breathtaking panoramas. Early morning arrival at the famous port of Lavrion/Piraeus. After disembarkation, continue to Athens for an overnight. A tour around the Vatican Museums to admire the beautiful tapestry gallery and the Sistine Chapel with masterpieces by Botticelli and Signorelli. See the "Genesis" and Michelangelo's "Last Judgment". An evening tour including some of the city's fountains and majestic squares and a meal in a typical Roman restaurant. First an orientation drive around this fascinating city, then a walking tour which takes you to Romeo's and Juliet's house and Piazza Bra with its famous Roman Amphitheater. By private boat cross the lagoon to the picturesque fishing island of Burano with its gaily painted houses. This ancient site is the most famous of Greek sanctuaries, where Zeus was worshiped and where his ivory and gold statue was counted among the Seven Wonders of the World. Enjoy an unforgettable evening of authentic Greek food, culture, dancing, and music at this fun interactive dining experience.